Have you just made the jump to intermediate French? 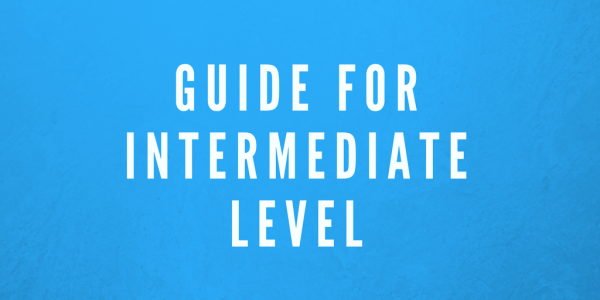 Or are you stuck on the intermediate level for quite some time with no immediate signs of moving on to the next? Regardless of which one you are, read up because this guide is especially created for you. I. What is expected of you when you reach intermediate level? When you reach intermediate level French (B1 or B2 in the Common European Framework of Reference), it means that you already have the ability to use French in communicating your ideas and you can understand the language with some ease. In B1 level, you can already produce simple and coherent text during conversations and you can discuss subjects you are familiar with. You can already narrate an event, describe things or ideas, and provide explanations or reasons. When you’re in B2 level (upper intermediate), you can already understand and discuss complex text or abstract ideas in a clear and detailed manner. Also, you are more spontaneous and comfortable in conversing with native speakers. In both B1 and B2 levels, you can already grasp ideas and even French jokes with relative ease, but some nuances and depth may still be lost on you. But you’re already nearly there! Did you see yourself in the scenarios described above? Now let’s move on to the common problems faced by intermediate level learners like you. Then we will try to address each common intermediate French issues as we go along. Sure there are a lot of materials available for learning French but as a lot of intermediate level French learners could attest, many of those resources are for too easy while some are too difficult. You need to find resource materials with a strong focus on listening; one that is especially created with your language troubles in mind. Motivation for learning French isn’t always easy to come by. That’s why here in Talk in French, I’ve always espoused the idea of creating a learning habit. With just as little as 30 minutes that you spend learning French each day, it will snowball into a lasting habit that will make learning French so much easier; something you do without having to force yourself. A good learning habit will make the difference in getting your motivation on track as you progress in your level. Here’s one of the first articles I wrote on Talk in French. You can use this to help you get started in building that habit. Whether you’re learning a language or any skill, there will always come a time when you will reach a comfortable level and you no longer seem to be improving (sometimes, you will not even want to make additional efforts anymore). What exactly were you planning to accomplish when you started learning French? Do you want to become fluent and perhaps pas​s a French proficiency test? Or are you simply contented with your current level? If it’s the former, then read #2 and score some added motivation to keep you going. If it’s the latter, why be contented with what you already accomplished? You have already started, might as well push further and get even better at it! To get yourself out of a plateau, psychologists and skill development experts suggest doing a “deliberate practice”. This means that you don’t just practice the language on autopilot mode or doing things “just because”. Create a highly-focused routine that will help you keep pushing further until you reach fluency. Remember, when it comes to learning a language or any skill in general, the quality of the practice you do beats the quantity of time you spend on it. Some learners hit a particular difficulty in learning and then they will get disinterested and abandon learning French altogether. In some cases, it could be confusing word pairs that cause the trouble. Don’t worry, with enough exposure to spoken or written French, this issue will disappear soon. For the meantime, you can master the differences with the following article and a quiz to test your knowledge afterwards. This is another major concern for intermediate level learners, but it’s nothing that practice can’t fix. To help you with that, I created a book that has since become a bestseller on Amazon. 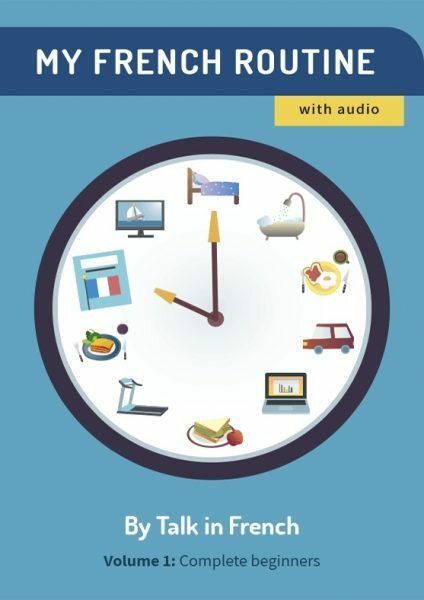 Perfect for intermediate level, this book helps you practice your French by reading and listening to short stories. The audio that it comes with it will help you with your listening comprehension and even help you practice your writing skills as well. Becoming fluent in French is now within your reach. Just a little bit more and you’re there. But bear in mind that jumping to advanced level French requires hours and hours of exposure to French including conversations with native speakers. Immersion is a good thing to try at this point but if you cannot stop your life to move to a French-speaking area for a while, don’t worry, it’s not the only way and there are plenty of alternatives for you. You can also do the same thing with French comics, French news, French magazines, online French sites, or any reading material. Widen the topics you read about, not just topics that already interest you. Moving out of your comfortable topics means you will encounter a new set of vocabulary that you may not have the chance to learn otherwise. Make a list of all the French words you don’t know and look them up later. Find a conversation partner preferably a native speaker. There are plenty of sites online that you can try such as interpals, conversation exchange, language exchange or italki. Even something as simple as typing in google “french conversation partner + your area” might also help. The important thing is to have the chance to talk in French as much as you can. In addition to having a conversation partner, try speaking French even if you’re all alone. Talk to yourself in French until speaking French becomes second nature to you. You can also record yourself so you could check your pronunciation and sentence structures afterwards. Whether it’s through French cinema, literature, music, art, and so on, take an active interest in French culture. It will give you plenty of conversation fodder when the need arises, plus of course, the wide range of vocabulary you will pick up along the way. Let’s face it, you cannot make the big jump to advanced level without ironing out the kinks in your grammar. Polish your knowledge in French grammar first and have a more thorough practice with it. Don’t worry, these efforts will all pay off massively. There are plenty of resources in the Talk in French website that will help you move from intermediate to advanced. Make use of it since most of it can be availed for free. If you want more comprehensive resources, you can also check out the intermediate level e-books with audio at the Talk in French Store. Intermediate level French (B1 or B2 level in CEFR) means you can already communicate your ideas in French and understand conversations and jokes. But you may still have a bit of difficulty in understanding and expressing complex topics and nuanced ideas. Some of the common problems encountered by intermediate level learners include: lack of materials, lagging motivation, reaching a plateau, and listening and reading comprehension. These can all be addressed with the correct approach. You can move forward from intermediate to advanced level by expanding your vocabulary, more exposure to spoken French, diving into French culture, mastering intermediate level grammar, and speaking French every chance you get. There are also plenty of free materials from the Talk in French website that could help you get to advanced level. Do you want more learning guides like this? For the most comprehensive study guide focused on learning the French language, grab your copy of Fluent in French!